by Mark V. Crisman, D.V.M., Article donated by the mane points horse resource center. 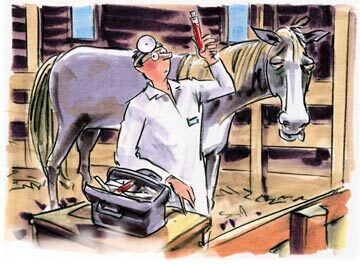 Anemia, one of the most commonly misdiagnosed problems in horses, is defined as a reduced oxygen carrying capacity of the blood. Red blood cells contain hemoglobin, which carries oxygen to all tissues of the body as the blood circulates through vessels and capillaries. Any condition that results in blood loss or a failure of the body to manufacture red blood cells can lead to anemia. Read the next horse diseases article on Equine Arthritis.